Conventional ovens do not produce a uniform heating process. Microwave sintering has been considered as altertative to conventional sintering since 1980s because of its several benefits including more precise and controlled volumetric heating, faster ramp-up temperature, lower energy consumption, and improved properties of the ceramic materials. Cheung and Darvell concluded that a minimum number of porosities can be achieved when high sintering temperatures are attained quickly. This supports the contention for the use of microwave energy to sinter ceramics, as higher temperatures can be reached in a short time. The nature of the interaction between microwaves and ceramics is complex and is dependent on the dielectric loss property of the ceramic, according to which materials can be classified as transparent, opaque, or absorbing. There are several studies that have confirmed that microwave sintering is capable of producing ceramics which are superior when compared with those produced with conventional sintering.,,, Prasad et al. 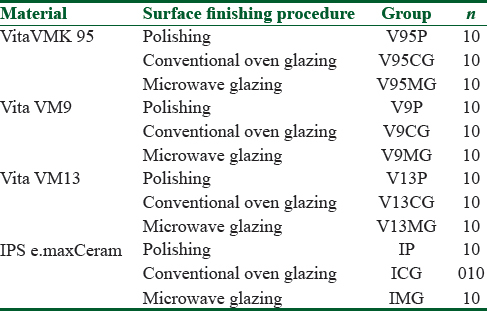 concluded that microwave glazing decreased surface roughness value of two porcelains compared with conventional oven glazing and hand polishing. But in that research, it was emphasized that the effect of microwave glazing on other porcelains could be different. The effect of microwave glazing on the surface properties of various porcelains is not clearly understood. Also, the effect of microwave glazing on the wettability of various dental porcelains is unknown. The purpose of this study was to investigate whether microwave-glazed specimens will produce smoother surfaces and lower wettability compared with hand-polished and conventional oven-glazed specimens. 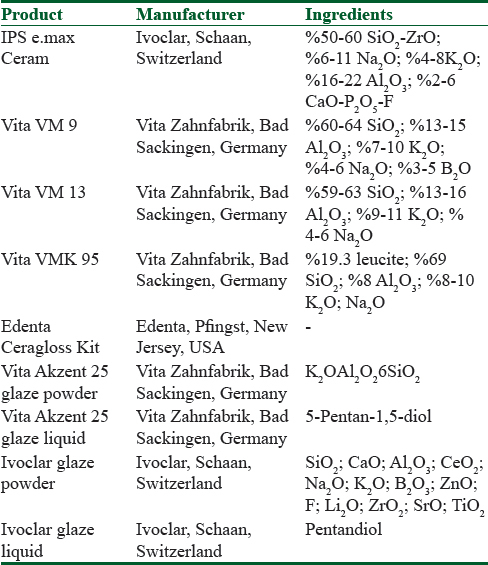 Four commonly used and commercially available dental porcelains, two different glaze powder–liquid, and a polishing kit were used in this study [Table 1]. A randomized control study was designed. Thirty-three disc shaped specimens (2 × 11 mm) of the four porcelain type were prepared using a 13-mm diameter brass mold with adjustable deepness by one investigator [Figure 1]. The porcelains were mixed using the same amount of porcelain and liquid, then placed into the mold. Excess moisture was absorbed with a tissue (Selpak; Eczacıbaşı Grup, Kocaeli, Turkey). All 132 specimens were sintered in a conventional oven (IvoclarProgramat P90; VITA Zahnfabrik) according to the manufacturer's instructions. The specimens were allowed to cool and then were finished using a medium-grit diamond rotary cutting instrument (Brasseler, Savannah, GA) with a slow-speed handpiece (NBBW-E; NSKNakanishi Inc, Kanuma, Japan) rotating at ~10,000 rpm with water cooling to remove surface irregularities. All ceramic discs were wet-grounded with 320, 400, 600, and 1200 grit silicon carbide paper during 20 s on a 300 rpm grinding machine (Buehler Metaserv, Buehler, Germany). The specimens were then ultrasonically cleaned (Eurosonic Energy, Euronda, Italy) with deionized water for 10 min and dried. The specimens were stabilized with a silicone impression material into a polyacetate mold and first surface roughness measurements (Ra, μm) were quantitatively performed for each sample using a profilometer (Perthometer M2, Mahr GmbH, Germany) by a single operator. The profilometer was calibrated before measurements of each group. Three roughness measurements were performed on three directions for each sample. The mean of nine measurements for each specimen was calculated and saved as the Ra0 value of the specimens. The 33 specimens for four type of porcelain were further divided arbitrarily into three groups based on the surface treatment, hand polishing, conventional oven glazing, and microwave glazing. To evaluate the ceramic surfaces at a microscopic level, one specimen from each group were taken for scanning electron microscopy (SEM) examination after surface finishing procedures. The groups are listed in [Table 2]. An experimental microwave oven (CeralabII, Meac) was used in this study to glaze the test group specimens. The microwave oven operated at a frequency of 2.45 GHz with a power output capability of 1.25 kW. 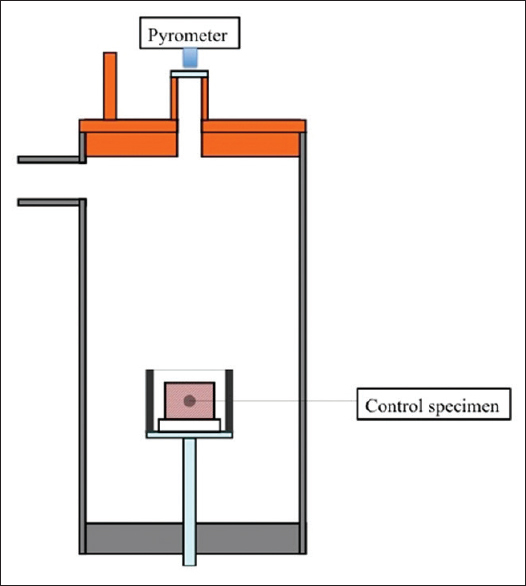 A pyrometer that measures the temperature in the oven according to color change of the control specimen was used [Figure 2]. Microwave system was connected to a computer to ensure that any prescribed temperature inside the chamber was precisely reached. Eleven specimens of each type of porcelain were glazed in the microwave oven at the recommended glazing temperature according to the manufacturer's instructions [Figure 3]. Eleven specimens for each type of porcelain were glazed in a conventional oven (IvoclarProgramat P90; VITA Zahnfabrik) under vacuum, according to the manufacturer's instructions. Eleven specimens for each type of porcelain were polished by polishing kit using a slow-speed handpiece rotating at ~12,000 rpm, as advised by the manufacturer. The adjustment kit consisted of a three-step process: green CeraGloss “finishing,” blue CeraGloss “polishing,” and yellow CeraGloss “high-lustre polishing” polishers were used, one at a time, for 20 s. A technobox (BienAir SA, Bienne, Switzerland) was used for setting 12,000 rpm. The specimens were stabilized with a silicone impression material into a polyacetate mold and three measurements were performed on three axes as close as possible to center of each specimen as described above. A mean value was calculated from these nine measurements and recorded as Ra1 value for each specimen. The surface roughness data (Ra0, Ra1) were analyzed using Tukey's HSD test at 5% significance level. In addition to quantitative analysis, the surface morphology of one arbitrarily chosen sample for each group was observed with SEM (Jeol Ltd., Tokyo, Japan) at a magnification of ×2,500. The contact angle measurements were performed for microwave and conventional oven glazed groups of Vita VM 9 porcelain material that has the lowest Ra0 value. Contact angle measurements were performed in Tubitak Marmara Researching Center using Contact angle goniometer (DropShape Analyzer DSA100, KRUSS GmbH, Hamburg, Germany). The surface of 16 samples were cleaned using acetone and allowed to dry. About 0.2-μL pure water was dropped to the surface and contact angles were measured. According to Tukey's HSD test results, mean Ra0 values and group differences of the Vita VMK 95, Vita VM 9, Vita VM 13, and IPS e.maxCeram porcelain materials are listed in [Table 3]. The lowest Ra0 values were observed in Vita VM 9, Vita VMK 95, and IPS e.maxCeram, respectively, and were not significantly different from each other (P > 0.05). The Ra0 value of Vita VM 13 porcelain material was significantly higher than the others (P < 0.05). According to Tukey's HSD test results, mean Ra1 values and group differences of the Vita VMK 95, Vita VM 9, Vita VM 13, and IPS e.maxCeram porcelain materials are listed in [Table 4]. For Vita VMK 95 porcelain material, the highest mean Ra1 values were observed in Group V95CG and Group V95MG, respectively, which were not statistically significant from each other (P > 0.05). Group V95P had the lowest mean Ra1 value and the difference was statistically significant (P < 0.05; [Table 4]). For Vita VM 9 porcelain material, the highest mean Ra1 values were observed in Group V9MG and Group V9CG, respectively, which were not statistically significant from each other (P > 0.05). Group V9P had the lowest mean Ra1 value and the difference was statistically significant (P < 0.05; [Table 4]). For Vita VM 13 porcelain material, the highest mean Ra1 values were observed in Group V13MG and Group V13CG, respectively, which were not statistically significant from each other (P > 0.05). 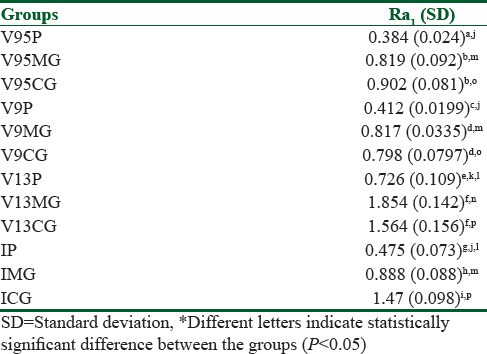 Group V13P had the lowest mean Ra1 value and the difference was statistically significant (P < 0.05; [Table 4]). For IPS e.maxCeram porcelain material, Group ICG had the highest mean Ra1 values, Group IP had the lowest Ra1 values. The differences were statistically significant (P < 0.05; [Table 4]). For microwave glazing, the lowest mean Ra1 values were observed in Vita VM 9, Vita VMK 95, and IPS e.maxCeram porcelain materials, which were not statistically significant from each other (P > 0.05). Vita VM 13 had the highest mean Ra1 value and the difference was statistically significant (P < 0.05; [Table 4]). For conventional oven glazing, the lowest mean Ra1 values were observed in Vita VM 9, Vita VMK 95, and IPS e.maxCeram porcelain materials, which were not statistically significant from each other (P > 0.05). Vita VM 13 had the highest mean Ra1 value and the difference was statistically significant (P < 0.05; [Table 4]). For polishing, the lowest mean Ra1 values were observed in Vita VMK 95, Vita VM 9, and IPS e.maxCeram porcelain materials, which were not statistically significant from eachother (P > 0.05). Vita VM 13 had the highest mean Ra1 value. This difference was significant for Vita VMK 95 and Vita VM 9 porcelains (P < 0.05), whereas not significant for IPS e.maxCeram porcelain (P > 0.05; [Table 4]). 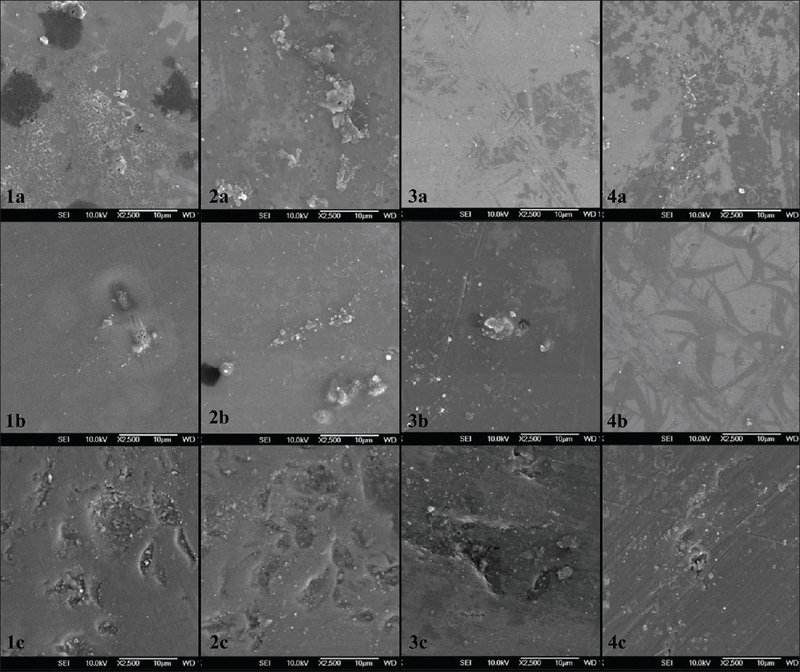 The surface morphology of conventional oven glazed, microwave glazed, and polished surfaces of Vita VMK 95, Vita VM 9, Vita VM 13, and IPS e.maxCeram porcelain materials are seen in SEM photographs at magnification of ×2500 [Figure 4]. Contact angle views of microwave and conventional oven glazed Vita VM 9 porcelain material are given in [Table 5]. All of the procedures involved in the fabrication of the specimens were similar to rule out any bias that could affect the results. For that reason, castable, pressable and CAD-CAM systems were not taken into consideration, in this research. The Ra parameter obtained with a profilometer is used to describe the surface texture of the porcelain specimens. This parameter describes the overall roughness of a surface and can be defined as the arithmetical average value of all absolute distances of the roughness profile from the center line within the measuring length. The results of profilometric analysis must be interpreted considering the information from the scanning electron micrographs.,,,,,, In this research, surface roughness of porcelain materials were evaluated quantitatively by profilometer and qualitatively by scanning electron micrographs. The polished specimens seemed to be rougher in SEM examination, whereas they had lower Ra1 values compared with microwave- or conventional oven-glazed ones for all porcelain materials. SEM examinations have usually indicated that glazed surfaces have better properties than polished surfaces, whereas a profilometric examination draws opposite conclusions. Although there are several studies which advocate that polishing produces surfaces as smooth as glazing does,,,, in some other researches, it was reported that glazing produce better, or worse,,,, surface properties than polishing. Cury-Saramago et al. reported that the Ra values of polished porcelain surface (Ceramco II) using Edenta polishing kit was 0.45 ± 0.30 μm. That value was similar to our findings except that of Vita VM 13 porcelain material. The lowest Ra1 values were obtained for Vita VMK 95 and Vita VM 9 and were not statistically significant from IPS e.maxCeram (P > 0.05) for polished specimens. Vita VM 13 was significantly rougher than Vita VMK 95 and Vita VM 9 (P < 0.05). The same surface finishing procedure resulted in different surface roughness values for different porcelain specimens. This finding agrees with Tholt et al. that reported different surface roughness values for polished three different porcelain materials (Vitadur Alpha, IPS Empress 2, and AllCeram). Prasad et al. reported that microwave glazing caused lower Ra values than conventional oven glazing for IPS d. Sign and Vita Omega 900 porcelain specimens. This result is partially compatible with our study results. In this study, microwave glazing caused lower Ra values than conventional oven glazing for Vita VMK 95 and IPS e.maxCeram porcelain specimens. This difference was statistically significant for IPS e.maxCeram (P < 0.05). Flury et al. concluded that glazing procedure had different effect on different porcelain materials. The difference between these two studies may be related to different porcelain materials used. According to this study results, there were no statistically significant difference between Ra1 values of microwave- and conventional oven-glazed specimens for Vita VMK 95 and Vita VM 9 porcelain materials (P > 0.05), whereas Vita VM 13 porcelain specimens had higher Ra1 values. This difference was statistically significant (P < 0.05). Vita VMK 95, Vita VM 9, and Vita VM 13 porcelain materials are glazed using the same glaze liquid and powder (Vita Akzent25, Vita Zahnfabrik, Bad Sackingen, Germany) at 900°C, 900°C vs. 880°C, respectively. Cheung and Darvell concluded that higher firing temparatures are related to lower porosities. The difference between Ra1 values may be dependent on lower firing temparature of Vita VM 13 porcelain material. In this study, the porcelain specimens were not supported with metal. Temparature changes during glazing and microcracks due to polishing may be a limitation for this study. The contact angle values of conventional and microwave oven-glazed Vita VM 9 porcelain specimens were 28.21°C and 29.09°C, whereas surface roughness values were 0.798 ± 0.08 and 0.817 ± 0.033 μm, respectively. Similarly, according to Aksoy et al. higher contact angles were related to higher Ra value. Low contact angle values indicate a hydrophylic surface, whereas high contact angles are indicative of a hydrophobic surface. It is reported that an increase of the hydrophobicity decreased bacterial adhesion. Bacterial adhesion is not directly correlated with contact angle results. Bacterial adhesion was not examined in the present study. This is a limitation of this research. Although microwave-glazed specimens did not have significantly lower surface roughness and wettability values than the conventional oven-glazed specimens, the microwave glazing procedure may be considered as an alternative method because of the advantages of providing volumetric heating, time, and energy saving. This study was supported by a grant from the Ondokuz Mayıs University Scientific Researches Foundation (PYO.DIS.1904.10.004). Pereira SMB, Kantorski KZ, Brentel AS, Valandro LF, Bottino MA. SEM analysis of the in situ early bacterial colonization on two novel feldspathic ceramics submitted to different types of glazing. J Contemp Dent Pract 2008;9:49-56. Griggs JA, Thompson JY, Anusavice KJ. Effects of flaw size and auto-glaze treatment on porcelain strenght. J Dent Res 1996;75:1414-7. Chu FC, Frankel N, Smales RJ. Surface roughness and flexural strenght of self glazed, polished and reglazed in-ceram vitadur alpha porcelain laminates. Int J Prosthodont 2000;13:66-71. Sarac D, Sarac S, Yuzbasıoglu E, Bal S. The effects of porcelain polishing systems on the color and surface texture of feldspathic porcelain. J Prosthet Dent 2006;96:122-8. Katz JD. Microwave sintering of ceramics. Annu Rev Mater Sci 1992;22:153-70. Clark DE, Sutton WH. Microwave processing of materials. Annu Rev Mater Sci 1996;26:299-331. Cheung KC, Darvell BW. Sintering of dental porcelain: Effect of time and temparature on appearance and porosity. Dent Mater 2002;18:163-73. Zhao C, Vleugels J, Groffils C, Luypaert PJ, Van der Biest O. Hybrid sintering with tubular susceptor in a cylindrical single-mode microwave furnace. Acta Mater 2000;48:3795-801. Sutton WH. Microwave processing of ceramic materials. Am Ceram Soc Bull 1989;68:376-86. Booske JH, Cooper RF, Freeman SA. Microwave enhanced reaction kinetics in ceramics. Mat Res Innovat 1997;1:77-84. Roy R, Agrawal D, Cheng J, Gedevanishvili S. Full sintering of powdered-metal bodies in a microwave field. Nature 1999;399:668-70. Prasad S, Monaco EA, Kim H, Davis EL, Brewer JD. CoMParison of porcelain surface and flexural strength obtained by microwave and conventional oven glazing. J Prosthet Dent 2009;101:20-8. Oh W, Shen C, Alegre B, Anusavice KJ. Wetting characteristic of ceramic to water and adhesive resin. J Prosthet Dent 2002;88:616-21. Scurria MS, Powers, JM. Surface roughness of two polished ceramic materials. J Prosthet Dent 1994;71:174-7. Buergers R, Schneider-Brachert W, Hahnel S, Rosentritt M, Handel G. Streptococcal adhesion to novel low-shrink silorane-based restorative. Dent Mater 2009;25:269-75. Whitehead SA, Shearer AC, Watts DC, Wilson NHF. Comparison of methods for measuring surface roughness of ceramic. J Oral Rehab 1995;22:421-7. Goldstein GR, Barnhard BR, Penugonda B. Profilometer, SEM and visual assessmeny of porcelain polishing methods. J Prosthet Dent 1991;65:627-34. Fuzzi M, Zaccheroni Z, Vallania G. Scanning electron microscopy and profilometer evaluation of glazed and polished dental porcelain. Int J Prosthodont 1996;9:452-8. Kou W, Molin M, Sjögren G. Surface roughness of five different dental ceramic core materials after grinding and polishing. J Oral Rehab 2006;33:117-24. Cury-Saramago AA, Coimbra PR, Izquierdo AM, Elias CN, Ruellas ACO, Sant'Anna EF. Ceramic surface polishing techniques after removal of orthodontic adhesive. Angle Orthodont 2009;79:790-5. Ersu B, Yuzugullu B, Yazici R, Canay S. Surface roughness and bond strengths of glass infiltrated alumina-ceramics prepared using various surface treatments. J Dent 2009;37:848-56. Endo T, Finger WJ, Kanehira M, Utterodt A, Komatsu M. Surface texture and roughness of polished nanofill and nanohybrid resin composites. Dent Mater J 2010;29:213-23. Aykent F, İnan Ö, Üşümez A, Sevimay M. Evaluation of surface roughness of ceramics following different polishing methods. Acta Odontol Turcica 2001;18:63-7. Al-Wahadni A. An in vitro investigation into the surface roughness of 2 glazed, unglazed and refinished ceramic materials. Quintessence Int 2006;37:311-7. Yuzugullu B, Celik C, Erkut S, Ozcelik TB. The effects of extraoral porcelain polishing sequences on surface roughness and color of feldspathic porcelain. Int J Prosthodont 2009;22:472-5. Hulterström AK, Bergman M. Polishing systems for dental ceramics. Acta Odontol Scand 1993;51:229-34. Wright MD, Masri R, Driscoll CF, Romberg E, Thompson GA, Runyan DA. Comparison of three systems for the polishing of an ultra-low fusing dental porcelain. J Prosthet Dent 2004;92:486-90. Artopoulou II, Powers JM, Chambers MS. In vitro staining effects of stannous fluoride and sodium fluoride on ceramic material. J Prosthet Dent 2010;103:163-9. Flury S, Lussi A, Zimmerli B. Performance of different polishing techniques for direct CAD/CAM ceramic restorations. Oper Dent 2010;35:470-81. Özarslan MM, Büyükkaplan UŞ, Barutcigil Ç, Arslan M, Türker N, Barutcigil K. Effects of different surface finishing procedures on the change in surface roughness and color of a polymer infiltrated ceramic network material. J Adv Prosthodont 2016;8:16-20. Tholt B, Miranda-Júnior WG, Prioli R, Thompson J, Oda M. Surface roughness in ceramics with different finishing techniques using atomic force microscope and profilometer. Oper Dent 2006;31:442-9. Aksoy G, Polat H, Polat M, Coskun G. Effect of various treatment and glazing (coating) techniques on the roughness and wettability of ceramic dental restorative surfaces. Colloids Surf B Biointerfaces 2006;53:254-9.